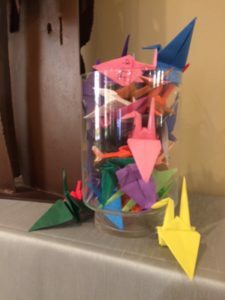 Folding paper cranes has been part of Rainbow’s narrative for many years, after it was first introduced as an intergenerational project by Phyllis, who along with her husband Bob, spent part of their adult lives living and working in Japan. The children who currently attend WorshipArts are too young, however, to remember the congregational history with origami cranes – so it was with wide-eyed attention that they welcomed WorshipArts alum, Seth, to share his expertise as the master folder of all the paper cranes currently gracing the front of our sanctuary! 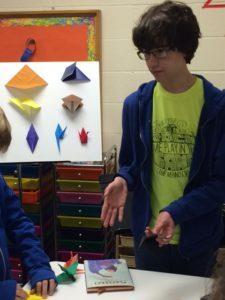 Now a teenager, Seth shared that he was first exposed to crane folding when he was a WorshipArts youngster at Rainbow (“but I don’t think I actually ever completed one…”). Later as a fourth grader, he read Eleanor Coerr’s book, Sadako and the Thousand Paper Cranes, and this story stayed with him. Coerr’s factual account of 11-year-old Sadako, an athletic Japanese girl sickened by radiation from the Hiroshima bomb, tells of her efforts to fold 1000 paper cranes in order to fulfill the legend that such a feat would cause the gods to grant her wish for good health. So this fall when Seth inadvertently came across an origami book in the library of his junior high, he was intrigued and looked up the directions for folding a crane…and then decided to fold 1000…in one month!! We were impressed and peppered Seth with questions like: How many cranes did you fold in a day? (about 33 per day); What kind of paper did you use? 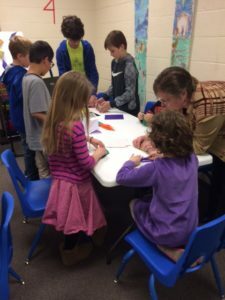 (mostly origami paper, but sometimes regular notebook paper and once, even, a fruit roll-up! ); Did you make a wish when you reached 1000 cranes? (not yet); What did you plan to do with the cranes? (no real plan until someone from church asked about using them for Lent – that seemed like an ok idea); and perhaps most importantly – Could you help us learn how to fold them? a weekly spiritual practice in this season of Lent.